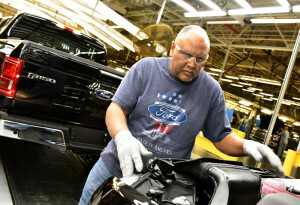 Ford on Friday doubled its ability to build 2015 F-150s with the official launch of its Kansas City Assembly Plant in Claycomo, Mo., — meaning that collision repairers across the country could see much more demand for work on the aluminum truck. With this and the already active F-150 manufacturing operation at the Dearborn Truck Plant in Dearborn, Mich., Ford can build more than 700,000 F-150s a year. Last year, the Dearborn plant made 350,000 and the Kansas City, Mo.-area plant built 300,000, Ford spokesman Mark Levin said Tuesday. Levine said that all three crews were working at the Kansas City plant, and it can produce 20-25 F-150s an hour. The factory, which had undergone about three months of work to accommodate the truck’s latest model year, can manufacture all 2015 F-150 types, including those with cargo boxes and larger payload capabilities sought by commercial fleets. It can also make Transit vans. New Ford F-150s are flying out of dealerships quickly, Ford said earlier this month during discussion of February sales. While that’s probably because of the reduced supply while the Kansas City plant was readied, it also indicates that the truck is being well-received by consumers. “The all-new F-150 continues to be the hottest vehicles on dealer lots, turning more than four times faster than the industry’s overall full-size pickup segment,” sales and marketing Vice President Mark LaNeve said in a statement then. The adoption of an aluminum body in the wildly popular truck — the F-Series as a whole has been the No. 1 line in the country — means that collision repairers are under pressure to adopt costly training and equipment to keep up with demand. Ford will let anyone work on the radical new vehicle, but its list of company-approved shops and dealerships who have adopted that infrastructure will likely be the standard.